Since I moved in Berlin, I have been enjoying its numerous lakes, rivers and canals. I have a special crush on the Dahme, which joins the Spree in Köpenick, one of the boroughs of Berlin I like most. The quiet atmosphere of the river reminds me of Lake Maggiore, close to my hometown in Italy. Winter makes the sky of a darker shade of light blue, which contrasts with the houses’ warm tones. I can’t say I miss Italian lakes, when I have such pretty landscapes in my neighborhood. My friend Christoph posted a summary that I completely agree with, so I simply add my own observations. This book is about finding ways to respect and cultivate various interests without feeling forced to stick with a job/career/hobby forever. Like Christoph, I was not happy with all details, but I found many good tips on how to successfully manage a various life. I have experienced a very liberating moment when I managed to write down a complete list of the things I want to do in my life, and I can imagine myself doing with a reasonable detail. I was relieved to find that it’s not an endless list. This made me think that I can focus on those things and get them done, without that uncomfortable feeling that I’m missing something important. I appreciated Barbara’s way of proposing different solutions for time/resources management, instead of the unique silver bullet. I can even try more than one, even if I have my preferences already; I could always find a better one. The chapter on jobs has been very useful to me. I used to be very drastic and say: either I get the job I love 100%, either I accept a totally brainless job to save all vital energies for my hobbies – and get bread on the table. 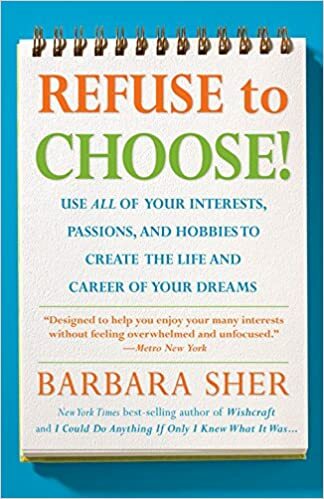 Many of the possibilities and compromises that Barbara presents at the end of the book looks so acceptable, partly because she presents them after giving all due space and dignity to interests that make life worth living. After reading this book, I thought that if I read it one year ago I would not have been so lost and hopeless. But still – I find that my big life changes had a reason and that I can now build anew, with good tips coming in anytime. Enjoy the reading, and if you wish to share your own comments, they are more than welcome! I especially appreciated how clearly he explained how round,uninterrupted movements generate good music. The preparation of a note is even more important than the downward movement that hits the drum, which should happen by gravity as consequence of an appropriate lifting of the hand or foot. It sounds weird in words, especially in my words; but I understood what made me feel so tired after that first drum session. I didn’t know how to prepare the movements (or I forgot; some were my routine exercises long ago), so I had to adjust and compensate every gesture in order to make all notes at the right time. There was no flow, and a lot of unnecessary tension. Now I got it! One more idea has been brought from unawareness to awareness. I realised once more how much my left-brain needs an explanation for itself before allowing the right-brain to play. It got a very good one, after which I enthusiastically thought: “Wow! That’s how I would like to play!” – something that I haven’t said for long time. I have been impressed and a little scared of how good other musicians were; but I couldn’t see how they arrived to such greatness, so I had no idea what to do myself, I felt bad, and turned to other more reassuring things. Now, with the help of my teacher and of lessons like this one, my priority is to find the key that makes an exercise alive. As today I have been guest in a kindergarten classroom, I had a lot of time to observe children, busy with so many things that only a child can think of. So full of energy, so willing, so curious, so cheerful. So random and still so focused; so unfinished by grown-up standards, but so crystal clear in their intentions and expressions. Why should that be a limited time of human life? How to keep the spirit of childhood alive, all life long, together with adult capabilities? This is for me an open question, but luckily I have live examples to study and follow (childhood as a state of mind? – stay tuned for another post…). I have been thinking at what kind of help adults can give to children, to support their growth. I identified three big cornerstones: acceptance, strength and knowledge. I assume that there can be more, but I cannot think of less than these three. First, I feel that I have to accept the child as it is, if I want to be helpful to him/her. Any shadow in this acceptance means that I would try to correct something that I consider wrong – and this will be harmful. I don’t hide that it’s very difficult. It’s so ingrained in us, that teaching means correcting. A good pupil is an obedient, predictable pupil, right? But there are treasures hidden behind the “good pupil” mask. Only by allowing the child to be spontaneous (i.e. noisy! bold! disobedient!) I can really know him/her and find ways to give support. Authority and understanding don’t share the same boundaries. From an authoritarian point of view, I would allow disobedience; but I could also be giving space to the child, because my goal is to understand him/her better. I am the only one to know if I am allowing disobedience because of my personal failure in making me respected. Then comes strength. I have to be strong, to effectively support the child when he is afraid or unsure; my inner child cannot be afraid or unsure of the same things as the child I am in care of. The child will invariably spot it and will not trust him/herself in facing the difficulty alone. Wouldn’t you do the same, if a guide in a foreign country showed fear in entering a particular place? Last but not really least, comes knowledge. I have to be capable in the tasks I show to the child, so that I know how much I have to rectify when the child tries to do them. With increasing experience, one leaves more and more space to trials and errors by the learner itself, because one trusts that he/she will find a good solution on his/her own – or to say, a good solution will become self-evident. Thank you children for humbling me, cheerfully; thank you, children-adults, for showing me the way. Today I wish to give an insight of what I do before start copying a picture, or making a drawing. There is much of what I read in books and blogs, and I hope you will find something useful for your own drawings. I chose it because I like horses very much, and also because it is already in black and white, so that I can copy it with a single, simple pencil. The picture come from the blog FantastykVoyage. What I do first is to follow slowly with my eyes all the borders in the picture. I start with the most obvious and sharp – eyes, eyelids, nostrils, cheeks. These borders are the lines that you would draw if you made a comic or a very quick sketch. Then I try to find other borders, this time between different areas with the same shade. For example the black shadow of the nostril, the shadows of blood vessels, the different shines of the coat on the head. Try to forget that it is the picture of a horse. Focus only on the shapes. This first scan through the picture will help you later, when you will actually draw – you will remember the lines you observed. A useful step is now to check proportions and establish a (mental) grid. Divide the picture with crosshairs or a finer grid. You can actually do it by superimposing a transparent sheet and draw the crosshairs with a felt pen; you can print the picture and draw the crosshairs directly over it. Don’t worry if you scribble on the printout, if it helps you get a better drawing as a result! This step will help you judging relative proportions of the shapes you will draw, and where they cross the grid or the borders of the picture. Sometimes I start drawing at this point: I draw all these borders, the ones from the subject itself and the ones from the shades. Sometimes I don’t, and wait for next observation step. Sometimes I grab a camera and take a picture, sometimes I don’t do anything at all, I am just happy to have found a great subject to observe. Next step is observing which areas have the same shade. It is useful to have scanned the picture as a whole before starting with the actual drawing, because I find much harder to start shading the first area in my drawing and then have to calibrate all further fills one at a time – it makes much more sense for me to draw all borders (some only very lightly) and then fill all areas with the same shade in one go, then pick the next shade and fill all its areas. Imagine to paint one colour at a time. You can be helped by image editing software, that has tools for the selection of areas with same colour. I had made an experiment with GIMP 2.8 and Posterize tool, that flattens the image to a given number of colours. In the case of a black and white picture, it uses black, white, and different greys. See Yalla’s picture with 2, 3, 4 and 5 levels. Nice observation exercise: find all areas with the same colour. It gets quite hard with over 5 levels but I assure it is rewarding and useful. You can decide to start with the darker areas or the lighter, as you wish; if you don’t know yet, try both approaches. Now choose a tool and a technique and start drawing: pencil, fine-pointed pen, charcoal, watercolour; lines, meshes, uniform shades, points… and have a great time drawing!